Non-domestic premises can benefit by taking advantage of the Green Deal to fund upgrades to existing technology such as infrared heating. The cost for small commercial premises is comparable to that of domestic homes. Infrared heating panels vary in price from the cheapest at £79 to larger, design friendly options that can range from £300 to £400 and can include mirror and picture panels. As with the installation of most heating systems, particularly on a large scale, the costs and ultimate savings often depend on the type of technology that is being replaced. Many smaller businesses are starting to install infrared heating as a viable and cost efficient way of heating their premises with additions such as remote thermostats further allowing them to control the amount they spend. 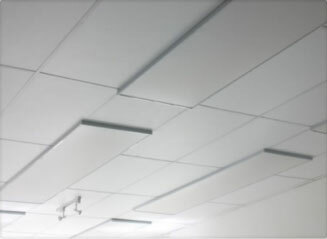 Bee Infrared Heating are a company who specialise in both domestic and commercial systems and quote work they performed on the premises for construction company Forgewood Midland who have an open plan office with forty work spaces. The company wanted to replace their old and inefficient hot water system and the Bee installed a total of 121 panels operating at 280 watts, all fixed to the ceiling. They calculated that this would save Forgewood Midland over £142,000 over ten years. For smaller businesses, having infrared heating installed can provide significant savings at a smaller initial outlay than other systems. Redwell installed a number of panels for McIntyres Hair Salons in Scotland including some panels that were printed with pictures from the company’s style portfolio. This had the result of freeing up floor space that had previously been taken up with bulky heaters and has provided a high level of thermostatically controlled comfort as well as reduction in energy bills.